Buying organic is usually a bit more, but there are some vegetables and fruits where it is particularly necessary due to the pesticides sprayed on them and other issues. Unfortunately, this juice recipe has quite a lot of them. Lemons are not considered to have a problem with pesticides due to their thick skins, but superfood greens like bok choy and parsley are often sprayed, as are celery and apples. Carrots should always be bought organic for a different reason. They are actually so good at absorbing toxins and heavy metals from the ground, that they are known as a crop to plant when the soil is too contaminated for other produce to grow in. Beets aren’t thought to be quite as bad at this, but should still should be purchased organic where possible. If you can’t find organic bok choy or celery, then make sure to soak and wash them in hot water and vinegar or use citrus based veggie wash and peel the apples. I really don’t want to discourage people from eating such healthy foods, but this is an important issue to consider with your fruit and vegetables. The Environmental Working Group has a list of the most and least sprayed produce if you’re interested. Now back to the juice. 1 to 2 heads of organic bok choy. 2 to 3 organic carrots. 2 to 3 stalks organic celery. The juice from a fresh lemon. Optional: Organic green powder like Grown American Superfood for extra nutrition. Start by juicing the lemon in a separate citrus juicer. Discard any seeds and pour the juice into the bottom of your juicer collection jar with a couple of ice cubes. Aside from how healthy lemon juice is, this is worth doing for every juice you make as it significantly cuts down on oxidation and preserves the nutrients you’re juicing for in the first place. You’ll need a good juicer to get the most out of superfood greens like bok choy. I’ve found this masticating one by Omega excellent and it’s done a much better job and lasted far longer than any of my old centrifugal juicers. It’s a good idea to alternate hard and soft vegetables when you juice, so for this recipe my order is first the carrots, followed by bok choy, the beets next, then celery and finally apples (which are always better used last as they can oxidize quickly). Mix up this beautiful looking orange, green and red juice into a less beautiful but extremely healthy elixir for your skin. Always drink freshly made juices immediately as they really don’t keep. I hope you enjoy it and please share any ingredient suggestions or variations you come up with in the comments below. Another tip to really power up this juice is to have a teaspoon of this lemon flavored cod liver oil just before you make it. The omega-3 fats, vitamin A and vitamin D are all great for your skin. Importantly though, the high levels of antioxidants carotenoids found in this juice are fat-soluble and will be absorbed even more effectively if you do this. Bok choy juice isn’t something you’d be likely to find suggested in a glossy magazine for healthy skin. But try it a couple of times a week for a month and you’ll probably see more of a difference made to your appearance than any expensive face cream could hope to make. 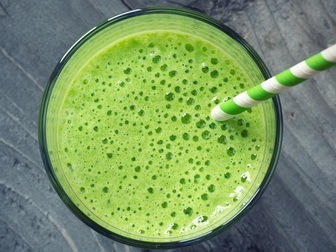 Next up is a skin improving recipe for those who like smoothies rather than juices with a delicious bok choy smoothie. Thank you for the ingredients, It’s a great drink for my Mama. I’m so happy that I’ve found your blog. Thanks very much for the recipe. I will try it for a month as you said, then I will come back to tell you if l noticed any difference on my skin.